In a large mixing bowl, cream both sugars with butter. Add vanilla. Blend in the eggs. Stir in the salt, cake meal and potato starch. Fold in the chocolate chips. 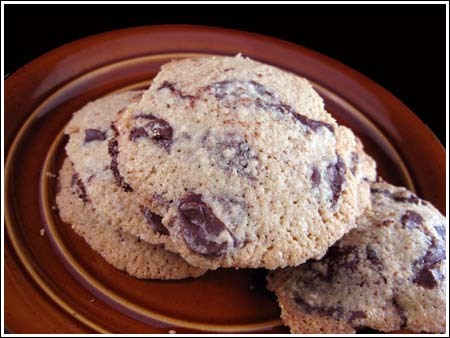 Chill the dough for 1 hour or overnight for chewy cookies, do not chill if you prefer thin, crisp cookies. Scoop out generous teaspoonfuls of dough or roll marble sized balls. Place on the baking sheets, leaving plenty of room for the cookies to spread (3 ½ inches). To make matzoh cake meal, place regular matzoh meal in a food processor and process for a minute or until finely ground. Original recipe did not include vanilla. It called for ½ cup sugar and 1 tablespoon vanilla sugar.